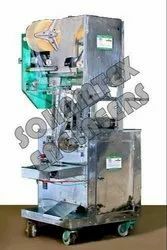 · Machine Speed: up to 2400 pack/HR. (Depends on size & Qty). · Electric control panel With Stepper motor & PLC. · Auto stop when raw incense was finished. · Diameter of Incense: 3mm to 5 mm. 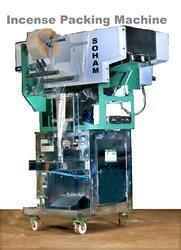 · Packing Roll width: 80 to 120 mm. · No. of sticks: 5 to 20 sticks/pouch. 5 to 50 sticks/pouch. 5 to 75 sticks/pouch. · Film Thickness: 0.02 -0.04 mm. · Machine weight: 250 Kg. · Warranty: 9 months in Main motor, Ac drive, PLC and stepper motor. 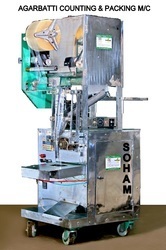 Production Capacity: Up to 2400 pack/HR. Machine Speed: up to 2400 pack/HR. (Depends on weight). Electric control panel With Stepper motor, HMI & PLC. Auto stop when raw incense is finished. Length of packing: 8” to 10” Diameter of Incense: 3mm to 5 mm. Packing Roll width: 80 to 200 mm. Weight: 5 to 250 grams/pouch. Warranty: 9 months in Main motor, Ac drive, HMI, PLC and stepper motor. 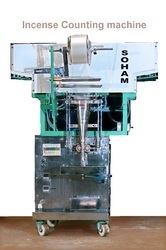 Machine Speed: up to 2000 batch/HR. (Depends on size Qty). Electric control panel With Stepper motor PLC. No. of sticks: 5 to 50 sticks/batch. Warranty: 9 months in PLC and stepper motor. 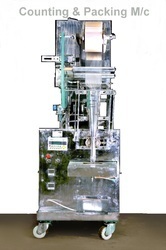 Automatic incense Counting pouching machine. Machine Speed: up to 2400 pack/HR. (Depends on size Qty). 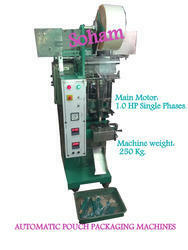  Machine Speed: up to 2400 pack/HR. (Depends on size & Qty).  Electric control panel With Stepper motor & PLC. 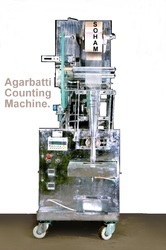  Counting System with Stepper Motor.  Machine Auto stop when raw incense finish.  Diameter of Incense: 3mm to 4 mm.  Packing Roll width: 80 to 140 mm.  No. of sticks: 5 to 50 sticks/pouch.  (10 pcs.-40 pack)(30pcs.-25 pack. )(40 pcs.-20 pack), (50 pcs.-15) Film Thickness: 0.02 -0.04 mm.  Machine weight: 250 Kg.  Free: Training of machine operation and general maintenance. Free: 1 tool set, Only 2 Suit free required extra suit you will be pay.  Warranty: 9 months in Main motor, Ac drive, PLC and stepper motor.  Easy to operate & low maintenance. 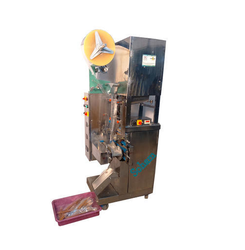 · Machine Speed: up to 2400 pouch/HR. (Depends on size & Qty). · Diameter of Incense: 2.8 mm to 4 mm. · No. of sticks: 1 to 75 sticks/pouch. · Film Thickness: 0.02 -0.06 mm. Capacity Up to 2400 pack/hr. 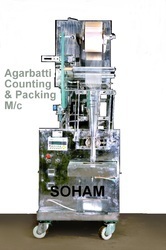 Production Capacity: Up to 2100 pack/HR. 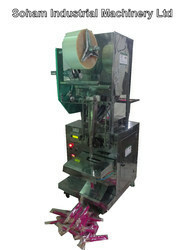 Looking for Incense Pouch Packing Machine ?